Melodic & Acidic Goa-trance is more alive than ever before! Last year we received such a high amount of quality tracks that we decided to release a new compilation with the best goa-trance! 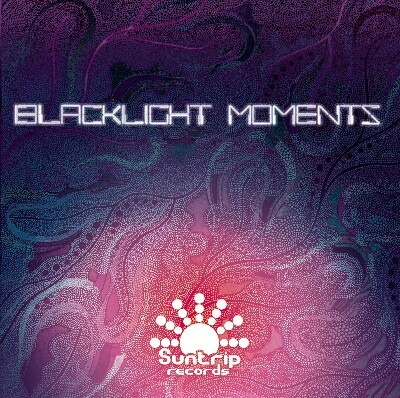 Blacklight Moments is not just another compilation. This is the return of Khetzal, the confirmation of artists such as K.O.B. (aka Filteria), E-Mantra, Mindsphere, Daimon and of course, the discovery of new talents such as Cosmic Dimension, Javi & Sko0ma, Psychic Voyag, Skarma and Uth! The cd starts with two darker and more acidic tracks by KOB (aka filteria) and Daimon (aka Antares). They both set a sinister atmosphere. Psychic Voyag follows these tracks with a deep and slower stomper which could have ben a part of classic compilations in the mid 90s! The middle part of the compilation is pure powerful melodic “old school” goa-trance, made in 2013 by Cosmic Dimension, Javi & Skooma and of course E-Mantra! This compilation will give all you goa lovers what you want, acidic night music, mighty euphoric goa trance and floating morning stormers! Enjoy and thanks for supporting Suntrip!